Welcome friends and fellow bat fans, to a brand new column which deals with the dark, disturbing and deadly storylines that have featured in the page of Batman from the ‘40s to the present day. From the famous storylines to the less well known ones, this column hopes to explore the great back catalogue of Batman comics. To start off, let’s look at one of the most famous storylines and a crucial one in the history of The Caped Crusader: A Death in The Family (Batman 426 -429). Jason Todd is in trouble. His reckless behaviour as Robin is leading him on a dark path. Batman knows that Jason needs some time off; perhaps realizing that Jason is not suited to the life as The Dark Knight’s sidekick. Jason decides to try and go back to his roots and discovers a shocking truth relating to his parents. He discovers that his mother is still alive and the women that brought him up wasn’t his biological mother. Meanwhile, The Joker having escaped from Arkham is determined to try and get some cash so he decides to sell a nuclear rocket he happened to have lying around. As both Robin and The Joker head east with Batman in tow things can only go from bad to worse. With a set up like this you would think that A Death in The Family couldn’t fail. However, you’d be wrong. The problem with A Death in The Family lies in the main point of it: to kill off Jason Todd. Todd had become generally despised by the comic buying public, mainly for his apparent arrogance and the fact that he didn’t work well with Batman. Now instead of laying down some motive for killing Todd, the writers simply have him find out his mother is still alive and that the three possible people who could be his mother happen to live in the same area in which The Joker is planning on going to sell his weapon. Aside from the fact that the opening sequence has to make us believe in a massive coincidence, Jason’s own death is based around such a bizarre coincidence. It turns out that The Joker has a connection with all three women who could be Jason’s mother. To top this off it turns out that when Jason finds his own mother she is being blackmailed by The Joker! Aside from the fact that The Joker seems to be shoved into the plot at random moments so that the reader can remember he is in the story, the idea that The Joker not only happens to be in the area but also is connected with Jason’s mother in such a way that it results in Jason’s death stretches the levels of credibility a bit far. After Jason’s death, the thin plot completely falls apart. 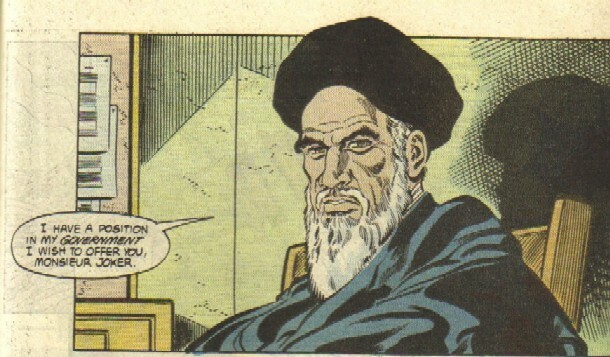 For some unknown reason (and possibly the weirdest moment in DC continuity, which even after The New 52 is canon) The Joker is given the job of UN representative for Iran by The Ayatollah. Wait. What?! In possibly the most bizarre piece of pro American propaganda ever, Batman’s greatest foe decides to team up with America’s then foe Iran resulting in The Joker getting diplomatic amnesty meaning Batman can’t apprehend him for the murder of Jason Todd. Aside from the whole situation happening simply so The Joker can remain free it opens a whole sea of holes. Why would the Ayatollah want The Joker as his UN ambassador? 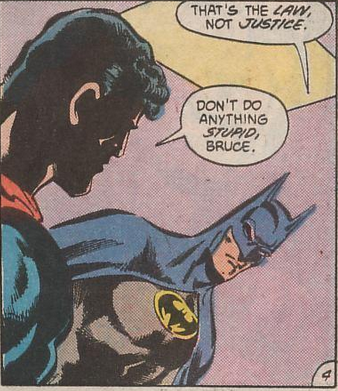 Did he do this to spite Batman? Does the Ayatollah want The Joker to kill members of the UN even if this means Iraq will end up getting bombed by the remaining leaders? We never get an answer to any of these questions. 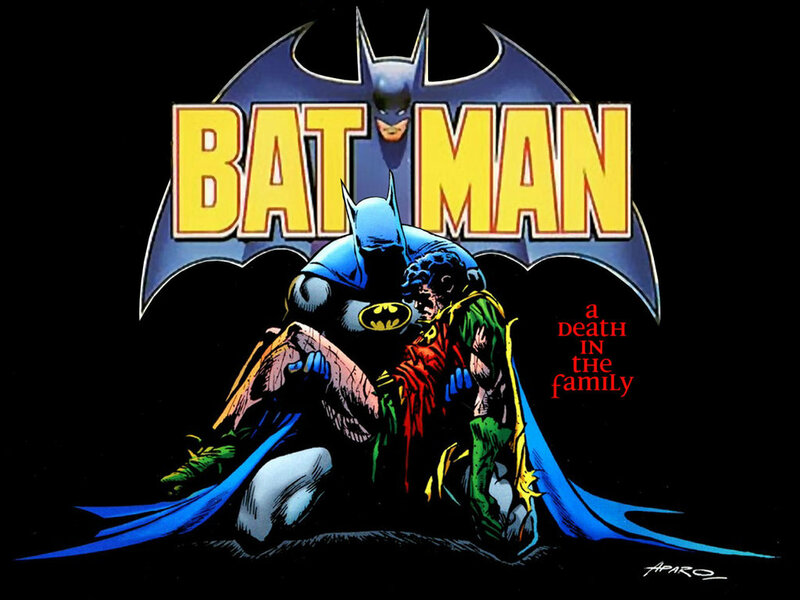 Overall, A Death in The Family has some strong parts such as the artwork by Jim Aparo, whose illustrations of The Joker in particular are stunning; it falls down ultimately in its central plot. The idea of killing of Jason isn’t strong enough. The death of Jason Todd would have worked much more effectively if it had been placed as part of a bigger and better storyline. Ultimately, A Death in The Family is a great wasted opportunity. In the next edition of The Dark Tales of The Dark Knight we look at Jason Todd’s introduction in Did Robin Die Tonight?